Well I am finishing the secret socks today—the tube like body of the sock is knit, and two mini skeins are set aside for the heels. Next up is doing all the documenting; this will include some short videos of the details. Making the videos is going to be difficult. As any home owner knows, MAINTANANCE is forever! It's no different when your home is an apartments in a 15 story building! Since I've lived here (10 YEARS) the ongoing maintenance has included: — redoing the roof (a flat roof, that needed to be striped, a new waterproof membrane, new flashing (and new parapets)and finally new roofing material), Re-pointing all of the bricks on all of the building, (local law 11 compliance), and at the same time installing new supports for the window AC units, upgrading all the furnaces --they now can burn oil (expensive at the moment) or natural gas (cheaper! ), just finished, the renovating all of the elevators (2 per building, 12 in all). The good news, is: the buildings are in better condition, and look better too!--and will better still with new railings. The railing project includes (as needed) resurfacing (or totally replacing) the concrete deck of the terrace. So (right now!) there is banging and jack hammering! The din is intermittent, (but does go on for hours!) and it interferes with with making home videos-- I never know when the noise will start, or when it will end (well, never before 8:30 AM and always by 5:30 PM) but for me, mornings are better (the light is better, I AM better, too!) But I didn't get started early enough—so no videos today. Just some still shots. The last pair I had sort of set up—but I really didn't like the blue yarn--(an almost navy blue) I wanted a dark blue.. but not so dark as navy.. So today I am mixing up some dyes (food coloring ones(easter egg dye tabs) and making some blue yarn and some toasty “pastry brown” too. Yarns are not all effected by the noise. Here is the first go at getting a nice deep blue—that is blue—not navy. –No more easter egg dye tabs—I am adding some bottled food coloring to the bath—40 drops of blue, 4 of neon purple—to make the blue just a bit warmer—and more intense. These new sock kits will be added to the 4 remaining sock kits (from the 8 set up in January) These kits sort of insure me the the ideas I think up for socks actually get knit up as socks. Of course there are diversions (the semi secret ones for a proposed class)--but fewer. And there is flexibility, too. I get to pick which sock to knit next--from a selection of ideas I know I like. Aren't those cute little bottles in the food dye boxes great? I'm going to save them for soy sauce containers for picnics. Not sure it's a good idea but giving it a try. "Yarns are not all effected by the noise." I don't know how you can stand jackhammers. 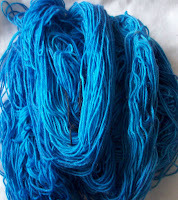 But maybe dyeing yarns will take you away and you are really getting nice colors. Huzzah! They are great!